The breakneck speed at which business is "going global" requires a new breed of executives, managers and front-line employees who are adept at the art of cross-cultural communication, where simple misunderstandings can jeopardise important deals. International travel is expected to increase, reflecting the continuing trends that are driving businesses of all sizes to penetrate new markets, enter into strategic alliances, improve productivity and tap into talent and expertise around the world, wherever these resources may be found.Whether you are preparing for a long-term overseas assignment, or a short trip abroad to meet with clients, customers, suppliers or distributors, "Global Business Etiquette" will be an indispensable resource for understanding the dynamics of cross-cultural communication, avoiding embarrassing (and costly) gaffes and successfully navigating the subtleties of social interaction that can set the stage for profitable long-term relationships. 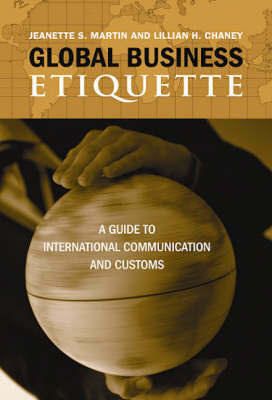 Drawing from their many years of research and training in the field; highlighting such important elements of communication as nonverbal gestures, dress, and present-giving customs; and featuring dozens of colourful examples and useful tips; the authors present a practical approach to interpreting signals and symbols around the world, overcoming stereotypes and mastering the nuances of international communication.